Slightly over 10 years ago I bought an Advent home computer in PCworld. It really served us well and never gave any real problems especially once I upgraded it from Windows XP to Ubuntu. However, I recently decided that I should upgrade to something more modern and I decided that I needed to splash out an buy reasonably good hardware if I expected this new PC to last as long as its predecessor. I was advised by friends to consider buying Apple. I don't have very happy experiences with Mac-OS, but my Mac loving friends tell me that I just needed to be more patient and once I learn the oddities of Mac-OS I would eventually fall in love with it. I briefly considered buying an iMac 27", but I balked at paying almost €2k for a PC. Eventually I settled on buying a Mac mini and a separate ASUS 27" screen which reduced the price down to slightly over €900. Having the screen and PC in one unit is handy, but didn't justify doubling the price. Overall I am quite happy with my purchase, but my opinion of Mac-OS has not really been a love affair. I have an old HP OfficeJet 4500 which should be capable of printring, scanning and faxing. However, due to a long standing fault in the paper feed mechanism it only works as a scanner. Linux just calls this a generic scanner and it works fine. Mac-OS recognizes it asa HP Officejet 4500, but even when I download a special driver from the HP web site it refuses to work (a helpful error message "internal error"). The computer refuses to suspend when I select sleep from the system menu, but at least it does suspend OK based on an inactivity time. There are a well documented set of control key combinations which are almost universally implemented in every computer system (e.g. crtl-C to cut, ctrl-V to paste etc.) It seems that Apple hate following any standard that they didn't invent themselves, but these key combinations are too well known to be ignored so they compromised by implementing them, but not with the control key. 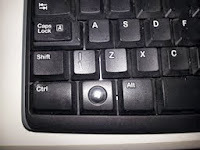 Instead they implement these with another key whose name that I don't know (it is in between the control and alt keys). This is OK once you practice using a Mac for long enough, but I still make the mistake of expecting the control key to work the same that it does in every other operating system. On the plus side I find that there are normally more help documents online for Mac than there are for Linux. I am a pretty persistent guy so I will stick it out a while longer before I take the nuclear option and install Ubuntu on my new system. Can you really learn all about Spotify in 10 minutes? 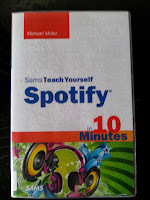 When I was in the library a few days ago I spotted a book with the catch title "Teach yourself Spotify in 10 minutes". I had been using Spotify for the last few months and thought I knew how to use the service already - but then I though "why not invest 10 minutes of my time to really learn how it works?" The title of the book is slightly misleading. Although it is really little more than a booklet it still took me about half an hour to read. (A5 sized and about 160 pages in length with much of he space given over to pictures). Nevertheless I was delighted with the valuable stuff I learned. I initially signed up for Spotify as a replacement for the Pandora service after they changed their policy and decided that Irish residents would not be allowed to use their service any more. I assumed that Spotify would be a direct replacement for Pandora - and I wasn't disappointing because it fulfilled this role fully. However, after reading the book I realized that Spotify has loads of features which Pandora doesn't (e.g. music sharing, 3rd party applications etc.) and so I was only using a tiny fraction of the service that I paid for. I strongly recommend this book to any Spotify user. Even if you can't borrow it for free from your library it still costs slightly more than one month's subscription and after reading this book you will get much more value out of the service you are paying for. At the moment Ireland has two parliaments, but tomorrow we will hold a referendum to decide if one of them should be abolished. I am in favour of the abolition and this post describes why. The Dáil is roughly the equivalent of the English House of Commons and its members are directly elected in a pretty conventional election process with single transferable voting. This parliament has all of the normal powers you would expect to make laws and appoint governments etc. The bulk (43) are elected by an electorate which consists of members of local government groups e.g. county councils and city corporations. These positions are normally filled by politicians who unsuccessfully went for election to the Dáil (the deadline for nominations is set to be after the result of the Dáil election is known - hence the public perception that they are essentially rejected or second best politicians. 6 members are elected by graduates of either Trinity College Dublin or the National University of Ireland (3 each). At the time when the Seanad was formed these were the only universities in existence. Over the year, graduates of some of the newer universities have occasionally complained about the unfairness of it - but in general nobody gets too worked up about it because nobody cares enough about the Seanad to get very worked up about it. 11 are directly appointed by the incoming Taoiseach. This means that the party with a majority in the Dáil is almost guaranteed to also have the majority in the Seanad. By tradition the Taoiseach's nominees have included some well respected public figures who were not associated with the government party, but this is only after they have appointed enough party members to ensure that they have a safe majority. Much criticism has been made of the fact that the Senate electorate are effectively the elite and privileged members of society. Of course, when the state was initially founded this was the intention. The idea was to form a second chamber which would have a larger influence from the protestant elite (who were more likely to have a university degree) which formed during British rule and to moderate the more extreme influences of the uneducated masses. However, I think that this motivation hardly makes sense in modern Ireland (I don't have statistics but I imagine that Catholics and Protestants have broadly the same chance of having a university degree today). The Seanad has effectively no real powers to influence legislation In theory they can delay the passage of legislation, but this has rarely ever been used. Therefore it is effectively a debating club. While I agree that some senators have contributed to public debate, these senators are a minority and in any case we could rectify the loss by asking the newspapers to provide better coverage of the debating societies that exist in all universities. Nobody really supports the current Seanad, but the debate has included many people who argue that we need a second chamber to provide more debate and they would argue that we should keep it, but reform the election process. This might make sense - but nobody has proposed a realistic proposal for exactly how the reform should be done. The campaign in favour of abolition has been mainly focussed on the potential financial saving, estimated to be €20m. However, I don't think this is really a large amount of money and it would be good value for money if it really improved out law making process (but as I said earlier it doesn't so I think I will be voting for its abolition).